Here are a few tips you must stick to religiously if you want healthy looking hair. You will be able to see the benefits in the long-term, within a period of 5-6 months if you follow these rules meticulously. Start detangling your hair from the ends and work your way above. 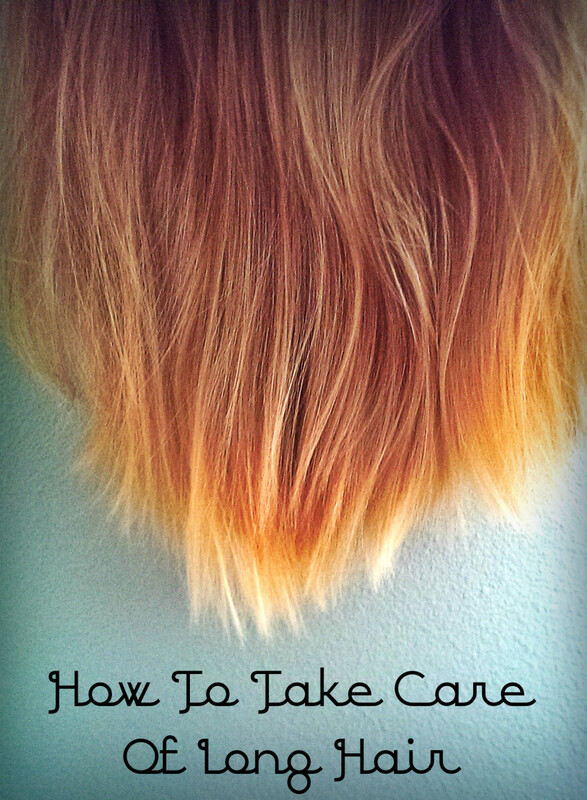 Do so taking your time, very gently to avoid damage to hair. Hair is very fragile. It is better to always use a wide-toothed comb as it can damage your hair less. Use a narrow-toothed comb only on the scalp area to set the hair. Make sure the comb you are using does not have sharp tips as it will then, damage or scrape the scalp. Part your hair into two or three sections when you are combing wet hair to give it a voluminous look after it is dry. Never rub your hair with a towel in an effort to dry your hair. Tie up wet hair with a towel and allow the towel to soak excessive water. Use a dryer if you must at a mild heat and at least 10 inches away from your hair. What are the characteristics that determine healthy, beautiful hair? 1. 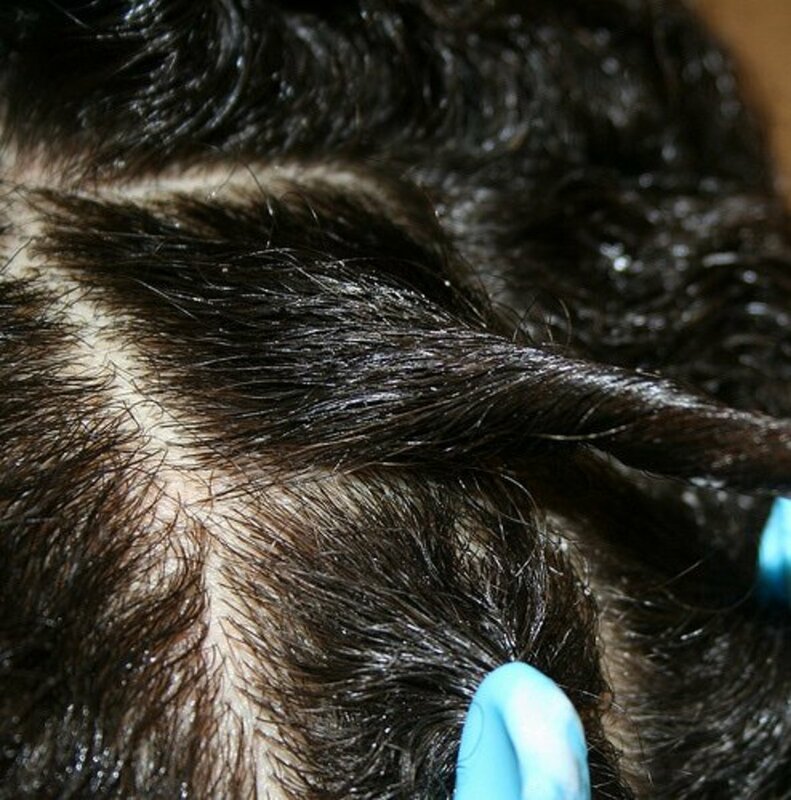 Thickness of hair - Thickness of hair varies from person to person. 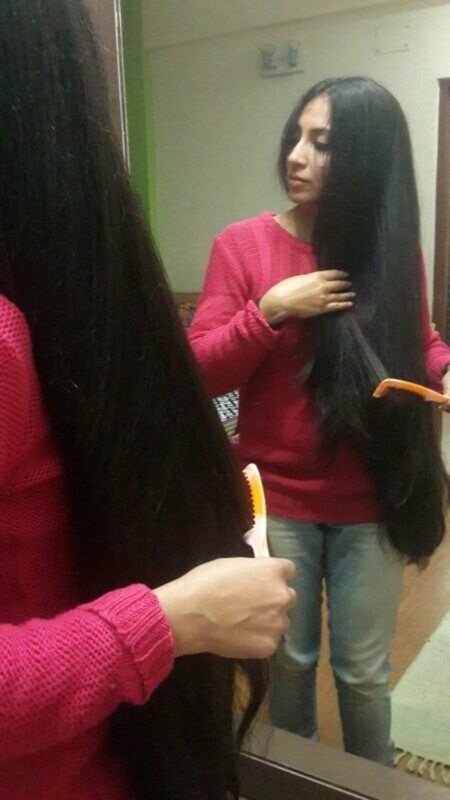 Some people have very thick hair whereas some have very thin hair. But what is important is to take note when you start having an abnormal hair fall or the natural hair-fall rate is more than usual. It is recommended that you visit a dermatologist or a hair-specialist immediately to get tested and find out the reason behind excessive hair-fall. 2. 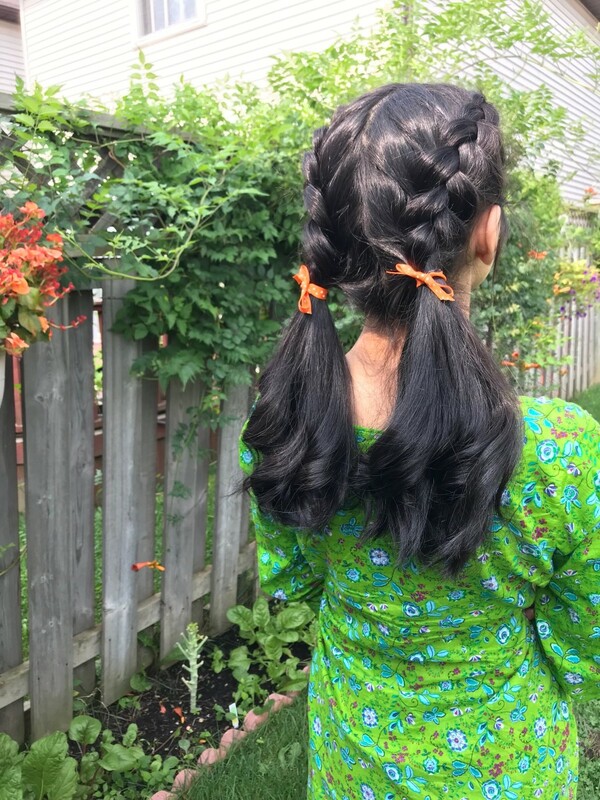 Richness of natural hair colour - Hair tends to lose its natural colour with excessive exposure to sunlight or with shampoos which are high in sulphur content. Usually, strong anti-dandruff shampoos containing selenium sulphide tend to strip the hair of colour with prolonged and continuous usage. 3. Clean, dandruff-free scalp - The pores in the scalp need to be clean and open to enable hair-follicles to make their way through them and grow into a strand of hair. Deposition of excessive dirt, grime or even dandruff can lead to blocking of the pores on the scalp, thus, preventing the growth of hair. 4. No split-ends - Split ends, in medical terminology, is called trichoptilosis. Split ends occur due to many reasons such as exposure to rough and extreme climate, rough handling while detangling the hair, use of harsh chemicals regularly like perming, hair-colours, waxes, sprays etc., use of heat-oriented styling products like hair-iron etc. 5. 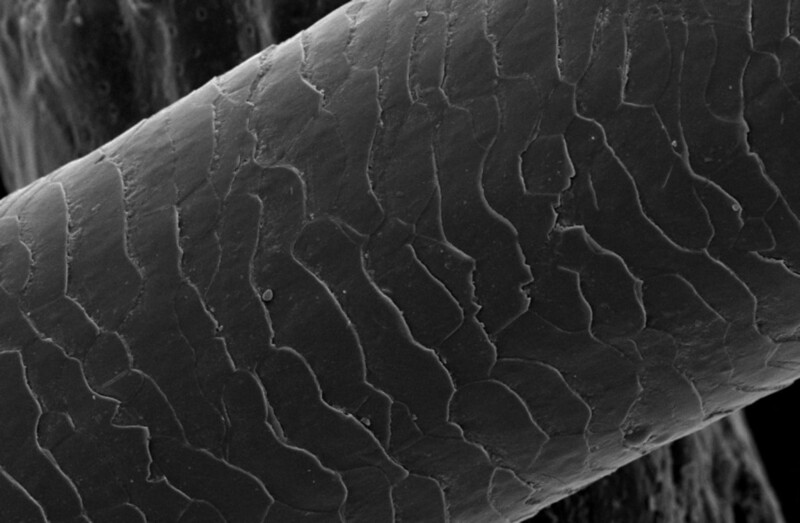 Smooth texture - When looked under an electron microscope, a strand of hair has a scaly structure, much like the body of a snake. The smoothness in texture therefore can be maintained if the scaly texture can be smoothed with moisture appropriate for hair type. 6. Bounce - This is a personal opinion and bounce does not necessarily mean your hair has to look straight out of a Vogue Magazine cover-page girl or like our favourite glamorous character from a Hollywood flick. Bounce determines that your tresses look full of life and not limp. View of a strand of hair under electron microscope. 1. Red Hibiscus leaves - Many people are unaware of the great benefits of red Hibiscus leaves for the hair. Red hibiscus leaves protect the natural hair colour. They also condition the hair and make it soft. 2. Amla (Indian Gooseberry or Phyllanthus Emblica ) - Amla helps prevent graying of hair. It makes the roots strong and binds copper and iron that are essential minerals for healthy hair. Amla is a rich source of anti-oxidant and makes the hair healthy. 3. Bhringaraj (Eclipta Alba) - Bhringaraj promotes hair growth and the growth of new hair and is an ancient Ayurvedic recipe for the hair from India. It has a weed-like growth and is found in damp regions like India, China, Srilanka, Bangladesh, Indonesia and Nepal. 4. Olive Oil - Olive oil prevents fungal infection or growth in the scalp, thereby, preventing dandruff and also arrests the production of the DTH hormone in the hair-follicles that leads to hair-fall. 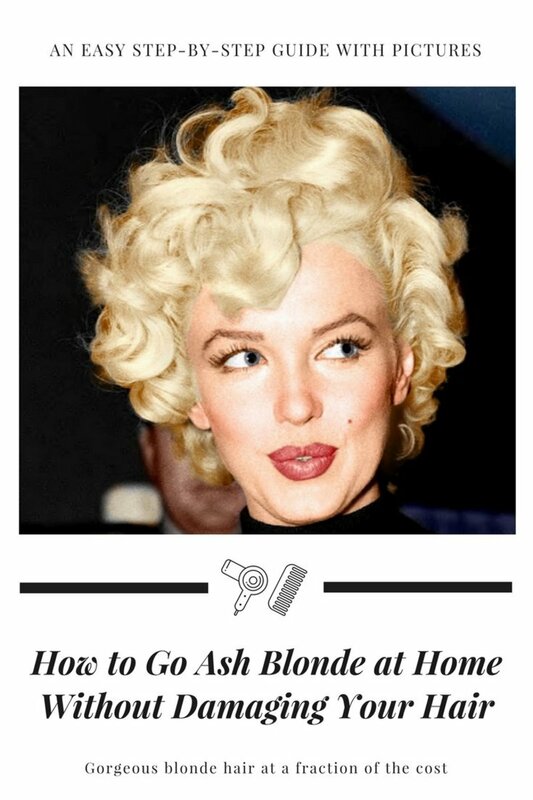 It prolongs hair life. 5. Almond Oil - Almond oil is rich in nutrients and strengthens the hair strands and prevents split-ends. It prevents dandruff and makes the hair soft and silky by providing moisture to the hair. 6. Coconut Oil - Coconut Oil restores natural moisture of the hair thereby, conditioning each strand and making it soft. 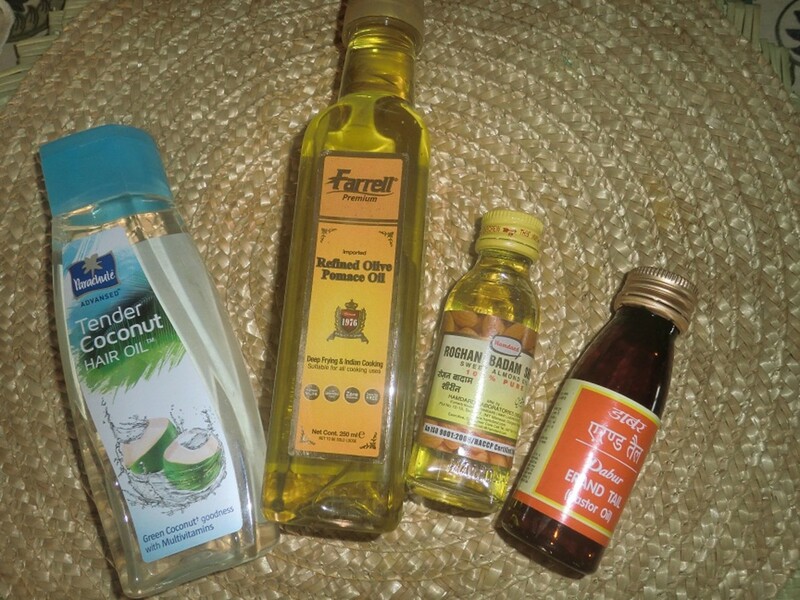 Coconut oil is used as the traditional natural treatment for dandruff in India since ages. A mixture of coconut oil and lemon juice is said to be the best natural treatment for a dandruff-free scalp. 7. Neem Leaves - Neem leaves contain anti-oxidants and anti-bacterial properties that prevent fungal growth on scalp and maintains a healthy scalp for healthy hair. 8. Castor Oil - Castor Oil is a super-stimulant for hair growth. It promotes the growth of new hair and its thickness lends moisture to the hair. It is highly recommended for those with a receding hairline or a balding top of the head. Pour all the oils into a deep pan along with the Amla juice and the fresh, cleaned leaves and give it a boil for 5-7 minutes. Strain the oil and pour into clean containers. Some of the oils like Castor Oil and Almond Oil are very heavy in this concoction. So, it is recommended that you do not leave this oil after application for more than one hour. Apply and massage warm oil to your hair roots gently and also apply some more hair oil to your hair strands till the tip and wrap your head in a steaming hot towel. You may remove the towel, dip it in hot water, wring the towel and repeat the process of wrapping your head with the warm towel for 20 minutes. Leave your hair for 20 more minutes after removing the hot towel and shampoo it off with a mild shampoo for the most beautiful hair! Yields: Produces enough oil for usage up to 6 months. I would like to share my experience with you regarding how I stopped my hair loss and the root cause I discovered over a period of time. 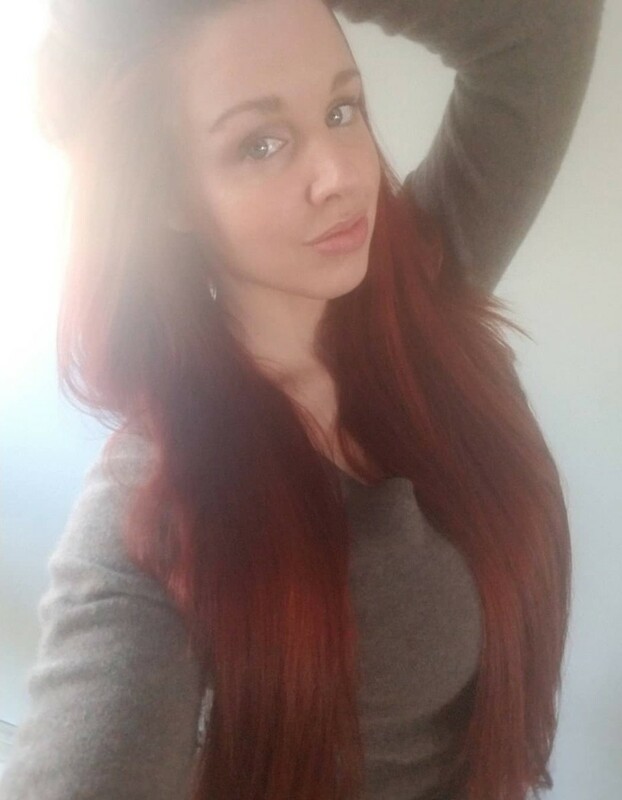 I used to have huge hair loss since last many years. Over a period of time, I noticed that the hairloss wold peak after a prolonged throat infecton that I regularly used to have. Additionaly, I used to have fever, skin infections and oily dandruff in the scalp. My blood test showed abnormal levels of mucous. Later on I noticed that my infection would increase as I would voluntarily couf to clear my throat of phlegm, when my voice quaverd. Then I stopped coufing and started clearing my throat by a comperatively less invasive method by producing the grinding kind of sound from my throat like "ArrmArrrrrrrrm, ArrmArrm" as many other people I noticed usualy do, by closing the vocal chords gently and blowing air forcefully through them. This was a bit difficult in the beggining. I used to end up with an increased quaver in my voice sometimes in an attempt to clear my throat and required multiple attempts to get the job done properly. Sometimes as I could not do this in the middle of a conversation and had to make do with a quavered voice for quite some time, untill I finished talking. I would sit through a mouvie show with phlegm clogged into my throat as I did not want to disturb others with my repeated throat clearing. But I did not loose patience and in the long term, my health improved. My blood is now pure, I feel energetic, no fever, no hair loss, no dandruff. This I acheaved without changing my hair care products, and taking any medicine. I tried all kinds of medicines preciously but failed to get permenent results. This post is for the benefit of other people. Hi there! I was appalled when I pulled up a "huge" thick, long hair ball from my bathtub drain! I am needing to care for my hair. I have not heard of some of the ingredients, such as Alma and •Bhringaraj (Eclipta Alba) Leaves . Can you give me a substitute please? If possible. Love you hair! Hi there I am abit confused do you add all ingredients including leaves to the oil and bring to a boil? Or do you boil the leaves in water and add that to the oil? Do you mean the petals of hibiscus? 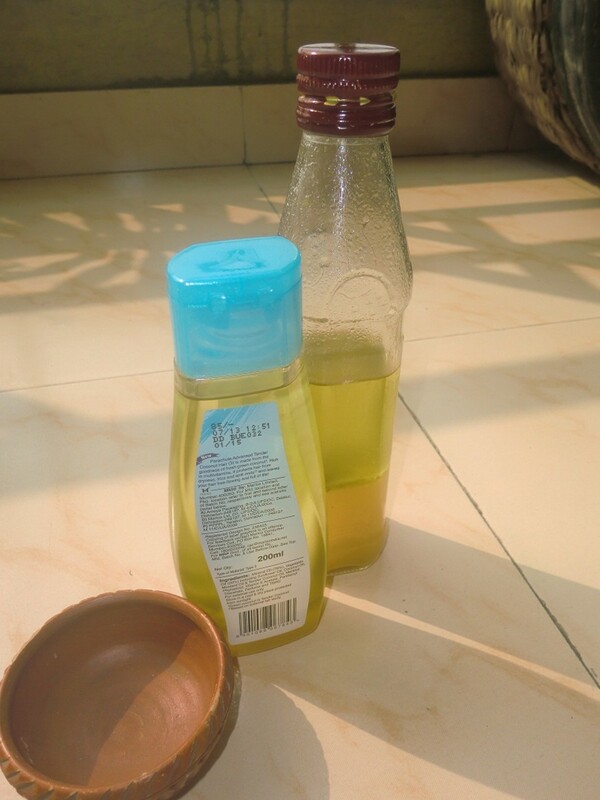 Excellent hub on hair oil. It was good to know. Voted up! your hair looks really good ..
my request is that could u plzz show me ur before and after picture ..
What are the side effect if we apply oil for more than hour. I am applying oil daily after bath, so which ingredient you thing I should avoid in your recipe and make the oil with rest of the ingredient. Apologies for replying so so late! 1. I chopped the amla and ground it to bring out the juice. Alternatively, since the juice and oil tend to separate when stored, you can just put the chopped pieces of Amla into the oil while boiling the whole concoction. 2. No you cannot substitute Bhringaraj leaves with curry leaves. Hi Dinesh, APologies for such a delay in replying. The oil will not be spoiled by the Amla juice. 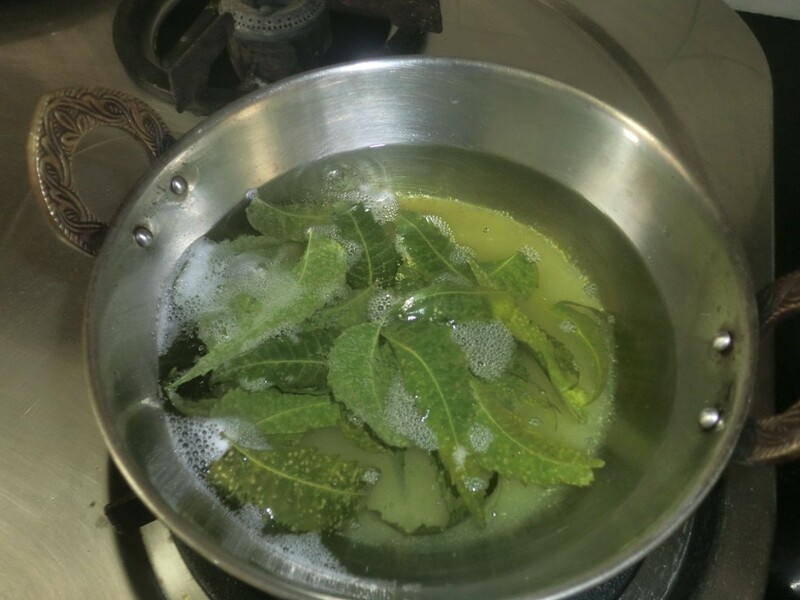 Alternatively, you can also chop fresh amlas and "fry" them in the oil along with the leaves. 2)can I substitute bhringraj leaves with curry leaves? 3)does bhringraj grow as a tree or as a shrub(which I can keep in a pot at home)? Does we have heat the oil in high flame? Also you have mention to add whole Red Hibiscus Leaves - 5, Fresh Amla Juice - 30 ml, Neem Leaves - 20, Bhringaraj (Eclipta Alba) Leaves - 10 is that we have to heat the oil until leaves get little fry and amla juice mix with oil or we have just heat the oil for 7 minutes and off the flame. If oil contains amla juice it will spoil the oil or not? Please clarify my above doubt. how long did it take to grow your hair that long and how long was it when you started using the oil?